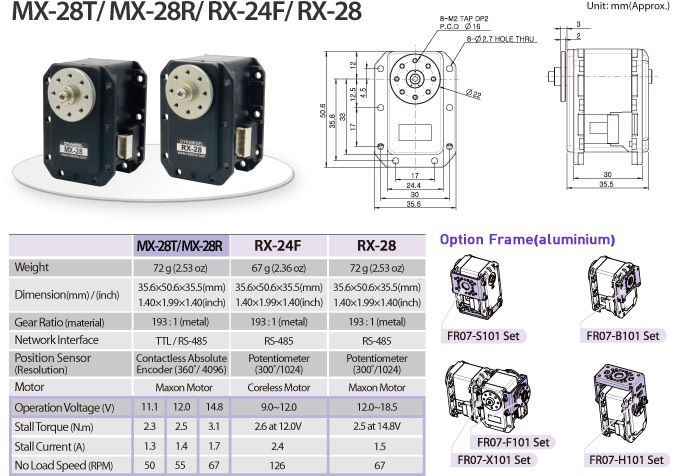 The MX-series is a new type of DYNAMIXEL with numerous advanced functions, such as precise speed control, 360 degrees of accurate positioning, PID control, and high speed communication. The MX actuator contains a new contactless magnetic rotary encoder for accurate angular movement over a full 360 degrees. The absolute angle measurements provide instant and reliable information of the angular position with a resolution of 12 bits = 4096 positions within 360 degrees. This delivers fine angle movements accurate to 0.088 degrees. The MX-series also integrates a new PID Control, which automatically and accurately corrects for naturally occurring errors such as backlash (caused by small gaps in the gears). Thus, positioning is more reliable and in compliance to specifications. Precise speed is controlled through serial data and has a resolution of 10 bits to accurately adjust the high speed movements into 1023 increments of speed control. Actuator status, commands, and sensor information are easily provided through readable memory and made available as a serial bit stream through TTL communication with a baud rate of up to 4.5 Mbps (4,500,000 bits per second).